Home Inspection Brunswick, GA | Quantum Home Inspections Inc.
At Quantum Home Inspections, INC., we pride ourselves on our comprehensive team approach to home inspections. Founder Phil Hipchen works cooperatively alongside two other certified inspectors and his office assistant. Our team approach ensures that each of our clients receives the customer care, attention, and thorough inspection that they deserve. All three inspectors are certified members of InterNACHI. With several years of experience as an energy auditor, Phil Hipchen takes a special interest in ensuring that each inspection performed by Quantum Home Inspections provides the client with useful information about home energy efficiency. Our inspectors thoroughly examine insulation quality as well as other energy source components so that they can discuss possible energy efficient upgrades with their clients. Buyers, sellers, and realtors who choose Quantum Home Inspections find that our team provides the professional knowledge, attention to detail, and outstanding customer service they can depend on. 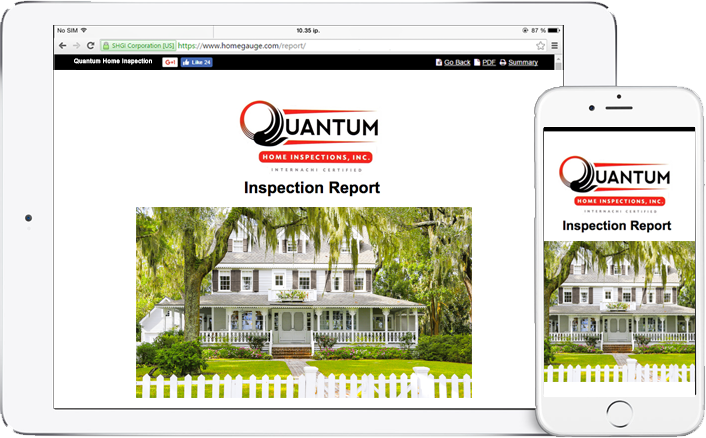 Quantum Home Inspections uses HomeGauge Software to generate our inspection reports. These reports are simple to understand and feature all of our inspector’s detailed findings, as well as high resolution, expandable images. Reports can be accessed within 24 hours after the inspection from a computer or mobile device. Each report also features HomeGauge’s Create Request List™ (CRL)™ tool, which allows clients to log in and create a list of the problems found during inspection along with ways they wish to pursue repair. This tool smooths communication between buyer, seller, and realtor. today to schedule your home inspection in Southeast and Coastal Georgia.